Missing baseball? Nothing to do on school holidays? Want to improve your skills and make new friends? 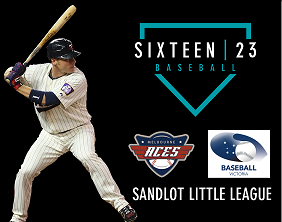 Baseball Victoria is partnering with Sixteen23 this summer to host the 2019 Sandlot Little League Camp from 7-11 January at Cheltenham Baseball Club from 9.00am-3.00pm daily. The camp offers a fun, safe, and healthy atmosphere where participants learn from some of Australia's and America's finest Melbourne Aces baseball players. Sandlot Little League offers up-to-date skills and testing. DAY 1: Skills and testing. Followed by being drafting into teams. Finishing with a HOME RUN DERBY! PLENTY OF PRIZES FOR ALL THOUGHOUT THE WEEK! The 2019 Little League Summer Camp also provides players (and parents) with an introduction to the Victoria Aces High Performance Pathway with player assessment results added to the Aces' High Performance tracking database. Participants will be coached by staff from Baseball Victoria and players from the Melbourne Aces including Luke Hughes, Allan De San Miguel, Ryan Dale and more. Drinks and snacks will be provided but you will need to BYO lunch each day.